December seems to be a time for lots of conflict between students in the classroom. Maybe they are all just ready for a break from each other. 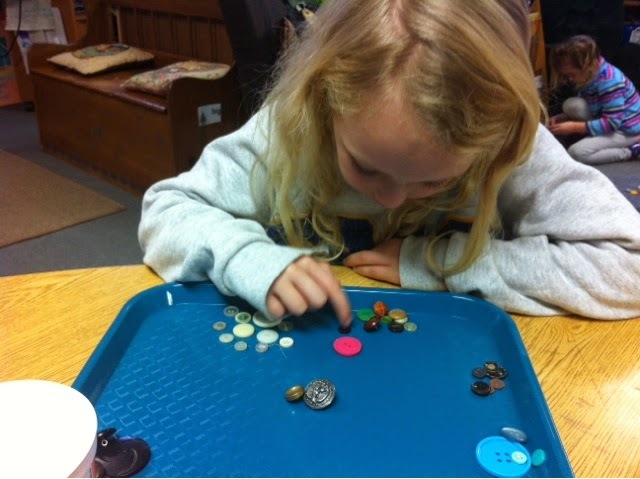 With all the activities and discussion early on in the year, the students have gotten very good about identifying when someone is filling or dipping in someone else's bucket. They also know actions that are peacemaking and peace breaking, but they seem to fall short in actually resolving conflict when it does arise. Telling someone that they are mean doesn't really do much to promote friendships, if what you really intend to say is your words are hurtful or I wish you would share. When we return to school in January, we will be engaging in some activities that will give students the opportunity to practice skills to avoid conflict and resolve conflict independently in the classroom. 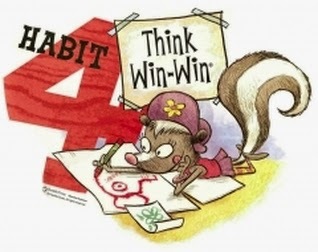 As you all know, avoiding and resolving conflict doesn't mean you have to be a doormat, and so we will be focusing on the Leader in Me Habit # 4: Think Win-Win. When to tell? When is telling tattling and when is it necessary? After making a two column chart and writing down our responses, we will hopefully determine that telling is necessary if someone is getting hurt or about to get hurt. We may come up with some other exceptions I haven't thought of yet. If there is a conflict you must resolve yourself, what should you do or say? We will brainstorm responses to specific scenarios and role-play often, helping students become more exacting in their language. If you accidentally touch someone, IMMEDIATELY tell them you are sorry and that it was an accidental touch. So many misunderstanding begin in kindergarten because someone accidentally bumped another student. If you are having any of the same issues with conflict at home, maybe you can find some of this useful. We were unable to visit the nursing home today because of the large flu break out. 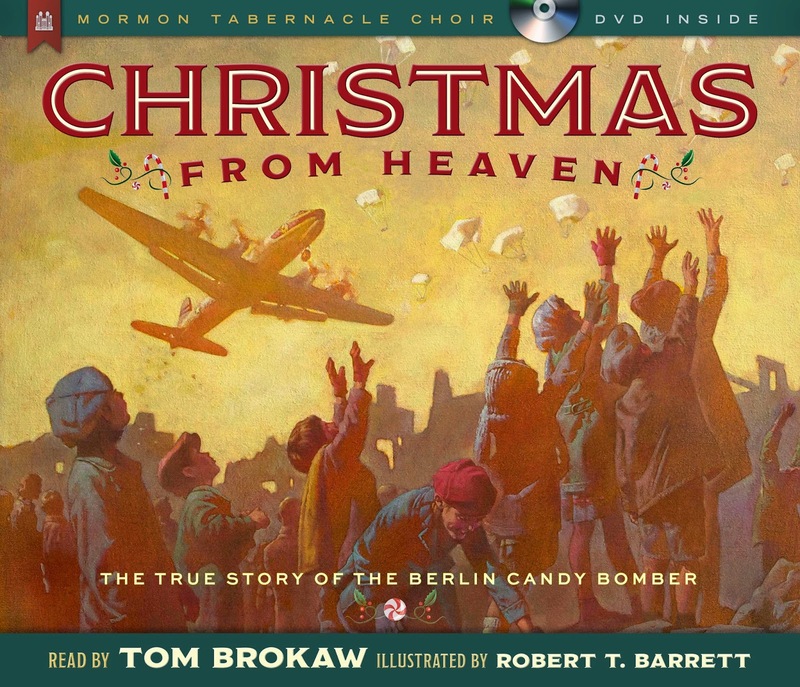 Sara Luthy shared this beautiful story, Christmas From Heaven; The True Story of the Berlin Candy Bomber with us today. It is a very touching story in which an American pilot helped heal the wounds of war. The message is that the real spirit of Christmas is to give whatever we have, no matter how small the gift. 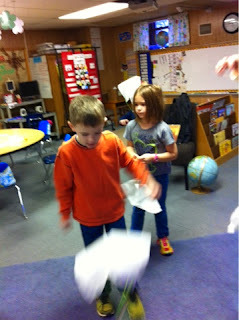 We then made parachutes with candy attached like in the story. After reading the story we asked and recorded our answers to the Five W Questions (Who? What? Where? When? Why?). We also considered the question What was Hal's gift to Jesus? and continue to brainstorm for ideas for our gifts to Jesus. Some ideas were our Christmas Program song, bringing cereal boxes for Haiti and non-perishable items for BC Food Pantry, helping our parents, saying our prayers, and using kind words. "From little things come big things." In this Mexican folktale, The Legend of the Poinsettia, it is a tradition in Lucida’s village for each family to bring a gift to baby Jesus at the Nativity on Christmas Eve. Lucida’s family had been asked to weave a new blanket for the figure of baby Jesus as their gift. When Mama gets sick and cannot finish the blanket, Lucida is worried that her family will not have a gift. On Christmas Eve, an old woman tells Lucida that any gift is beautiful because it is given. Lucida brings a armful of weeds to the Nativity and because of her sincerity, they are somehow transformed into beautiful red star flowers, the poinsettia. We took three days to read this book, first the beginning, then the middle, and finally the ending. After each reading we asked and answered the Five W Questions (Who? What? Where?When? Why?). The students seemed to be fascinated with this idea of weaving. We had first read about it in one of our Native American stories in November. Because of this, we did some simple weaving with paper strips. Since then it has been really fun to see the students observing weaving in the threadbare knees of their jeans and banners on the walls. A continuing theme last week and this was the idea of What will be our gift to Jesus? As a kickoff to today's Happy Birthday, Jesus! 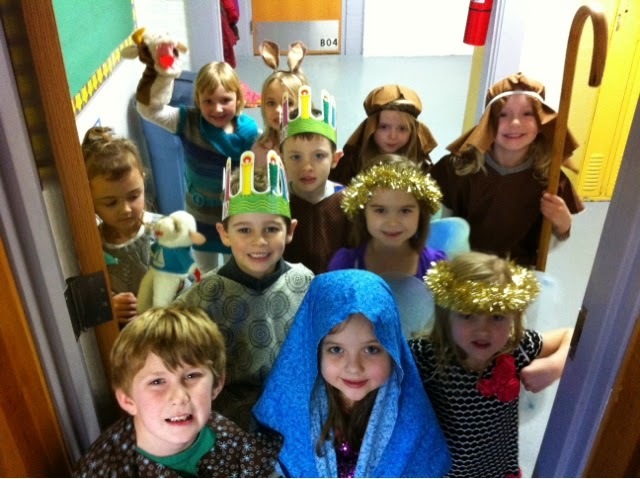 Party, Kindergarten participated in an adaptation of the Spanish/Mexican celebration of Las Posadas. Following a script, we went from classroom to classroom asking for lodging. Each time we were turned down until we went to the gym (where everyone had secretly assembled) and we were welcomed in. 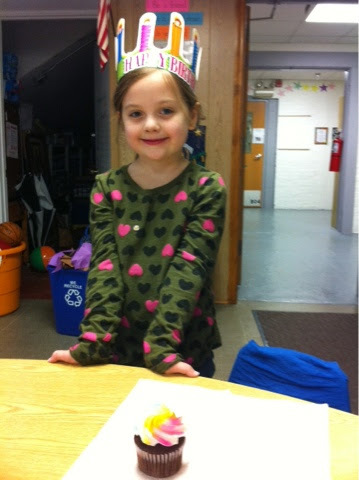 Happy birthday, Hollie! 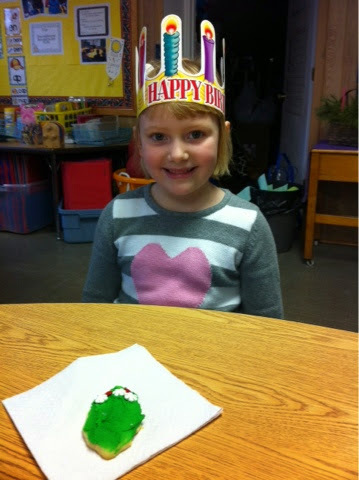 Thank you for sharing your holly shaped sugar cookies! This is my favorite Christmas video! Wondering what skills you can work on next with your student? 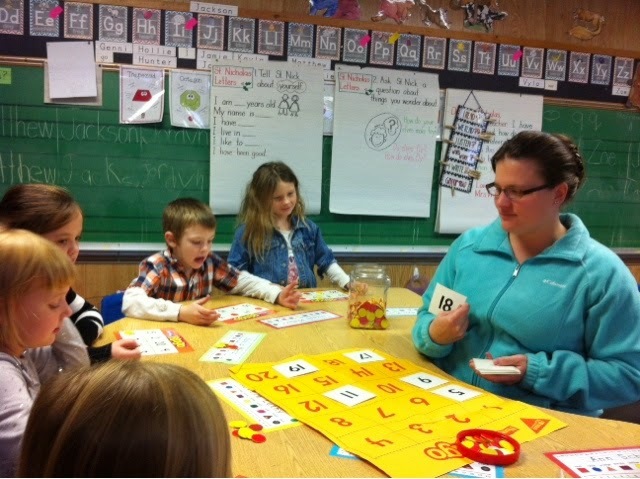 All students are very good at matching beginning sounds and identifying beginning sounds. Most students could use work in blending sounds into words. I say the 3 separate sounds /c/ /a/ /t/ and student says the word cat. Most students could use work in rhyming. Most students can produce a rhyme, but identifying a rhyme is more difficult. Give your student a series of 3 words, in which 2 rhyme. Have your student identify the rhyming pair. Of course, these are skills we will be hitting hard in January, but this is just to let you know the direction we will be taking next. DOT Volunteers really have our number! Thank you for the many hours of service you have given! 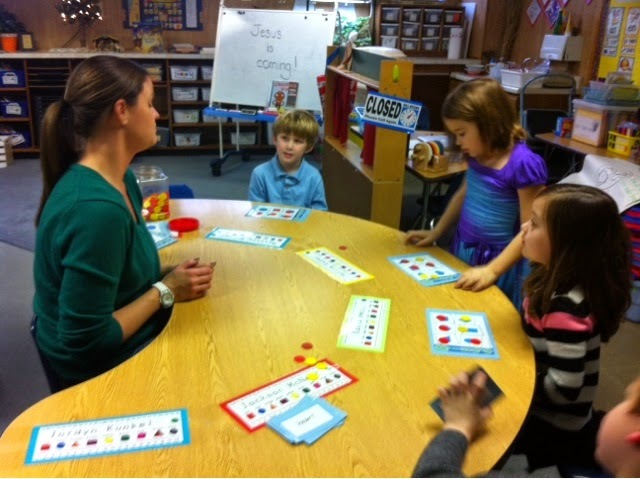 DOT volunteer and parent, Lisa McNeff, comes in weekly during Math time in the Kindergarten classroom. 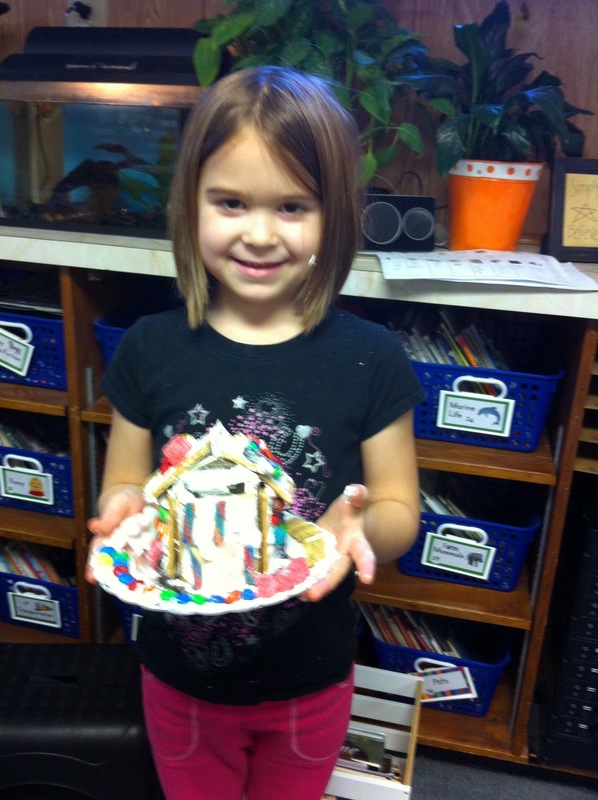 DOT volunteer, Amanda Barry, has recently started coming in weekly, this time to help make gingerbread houses. DOT olunteer, Charlotte Holt, comes in weekly to help with Math Centers. 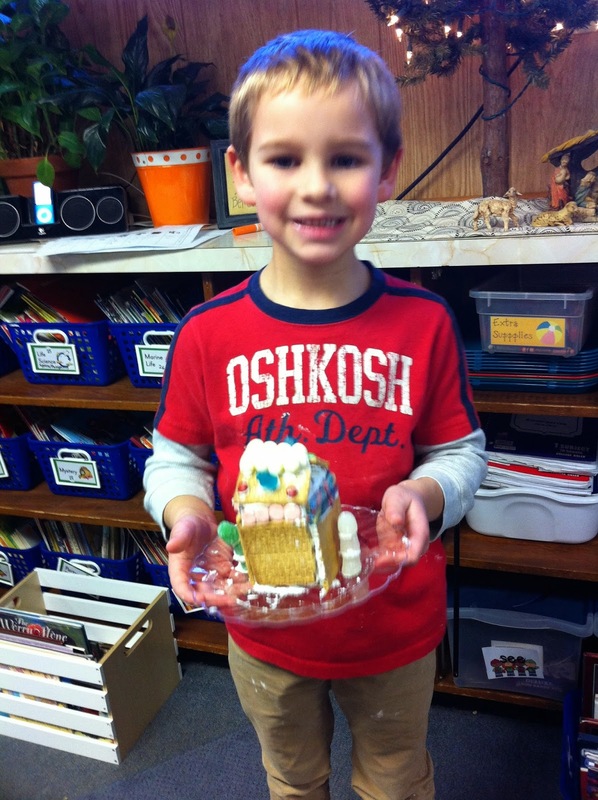 Thank you to Amanda Barry (DOT volunteer), Leigh Ann Boylen, Becca Kassing, Linda Luthy (Hollie's grandma), and Becky Niewohner for being such wonderful helpers with the gingerbread houses this afternoon. I believe the students had a GREAT time! 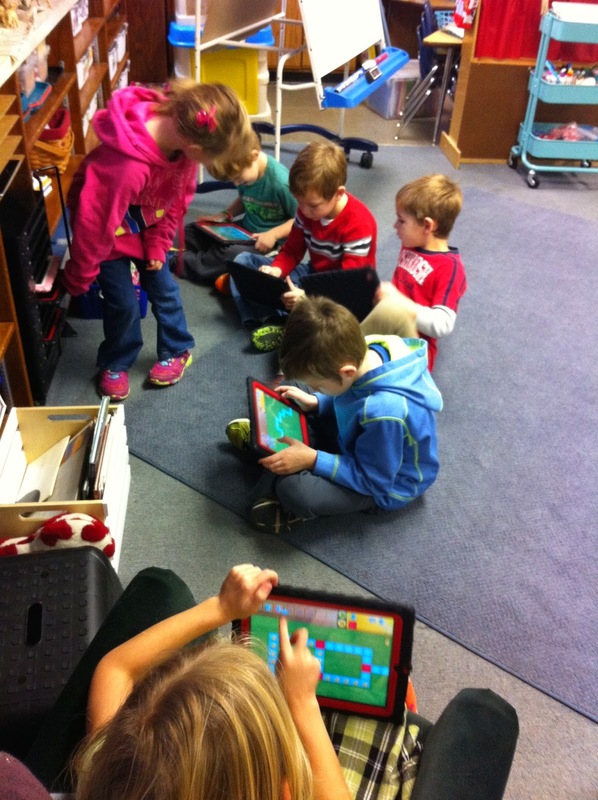 Kodable is an app that we have just introduced in Kindergarten. It is suppose to be a kid friendly introduction to computer programming. 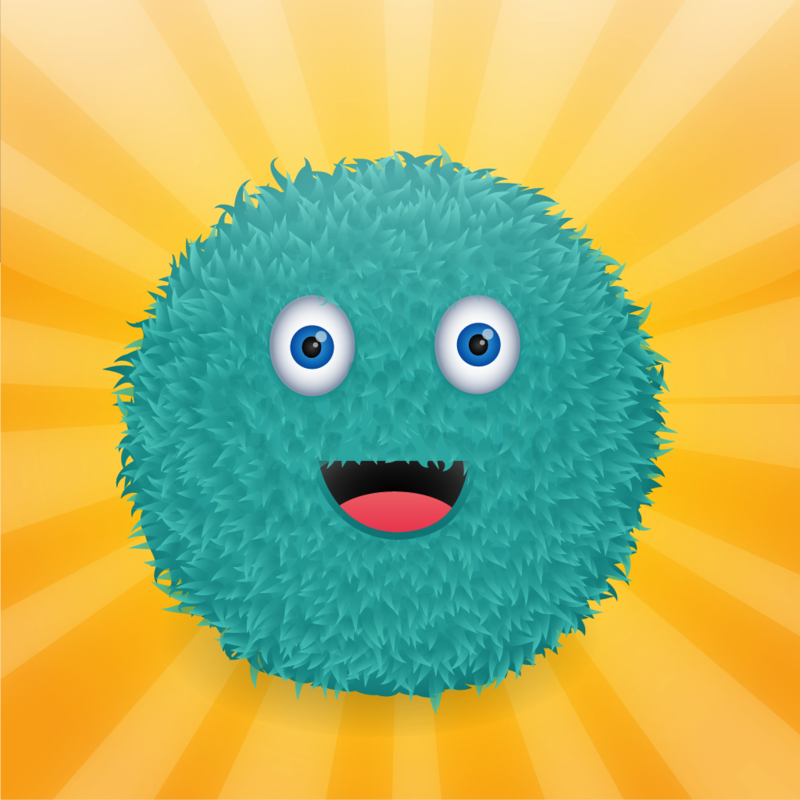 The goal is to get the fuzzy ball from one side to the other, while obtaining as many coins as possible. 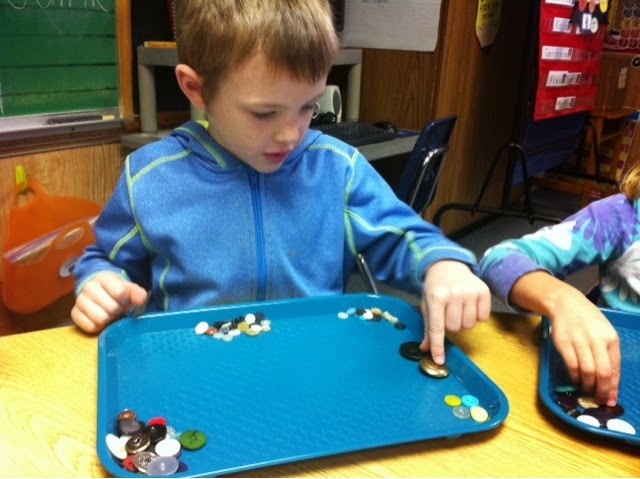 The students have to work on left and right, up and down, but they also have to use the color squares in the coding if they want the fuzzy ball to grab those coins in the middle. As they work their way through the series of mazes, they get progressively more difficult. 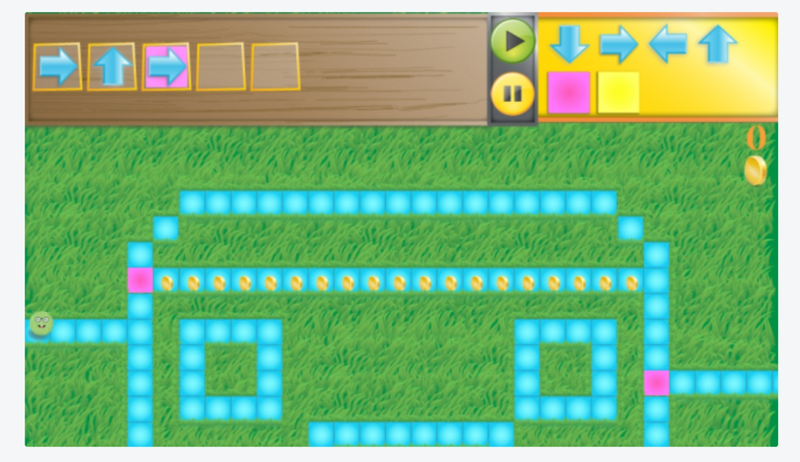 Many students now are using a repeating function to complete their mazes. It is great to see the students learn from each failure and apply what they have learned to eventually become successful. It is great to see them discussing the mazes and helping each other complete their tasks. Jackson said to me today, "This app is so hard." I asked, "Do you like it?" He replied, "Yeah, it's fun!" Most seem to like the challenge. A few want to give up easily, but are motivated to continue by the excitement of their friends. If you have an iPad at home, this is a free app from the iTunes store. Happy birthday, Alex! Thank you for the sweet treats! The goodie bags sent home Wednesday were from the Versailles Lyons Club. Happy half birthday, Kayla! 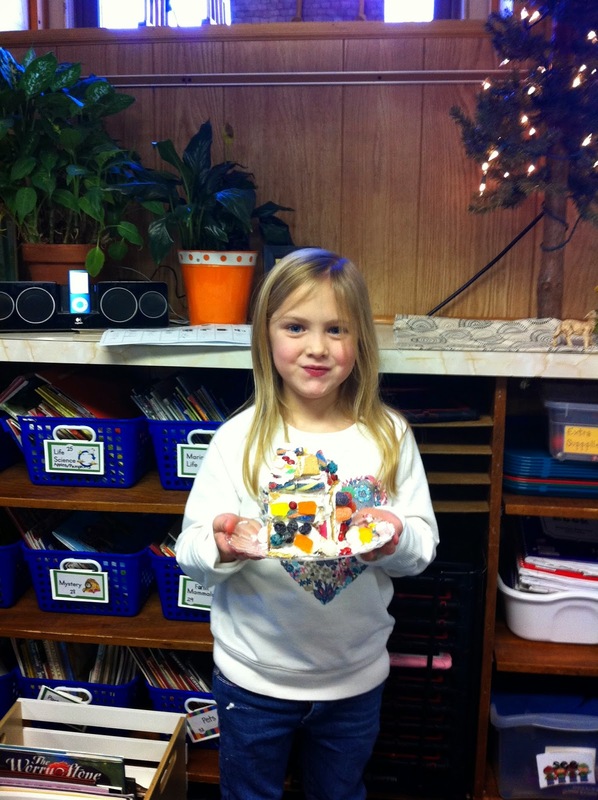 Thank you for sharing the yummy treats! I know parents won't be surprised by this video, but I'm just wondering how I am going to channel this excitement over the next two weeks! Lol! Father Steve and Deacon Mike take turns on Friday coming into the classroom to teach a lesson. 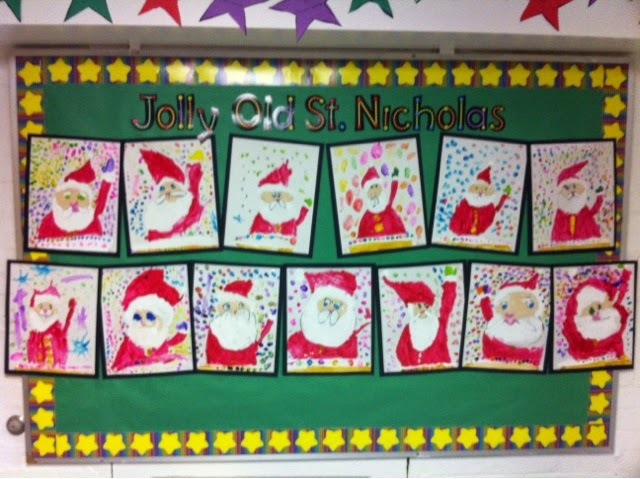 Santa Claus can be a ticklish subject in kindergarten, as each household has their own family traditions. We will be learning about St. Nicholas and using the names interchangeably as we write our letters for the Democrat Message. If you have concerns about this, please let me know. The students have really enjoyed our study of the Gingerbread Man this week, even though they are already very familiar with the stories. Because they are so familiar with them, we were able to go beyond just retelling the story and do some character studies. First, we read a traditional retelling of the Gingerbread Man by Eric A. Kimmel. We learned that good readers ask themselves questions before, during and after reading a story. Together we asked and answered Who? What? Where? When? and Why? about the story. Then we completed a character map for the Gingerbread Man. When we read The Gingerbread Girl and The Gingerbread Cowboy and completed the same character maps for them, it was easier to compare these three characters systematically point by point. 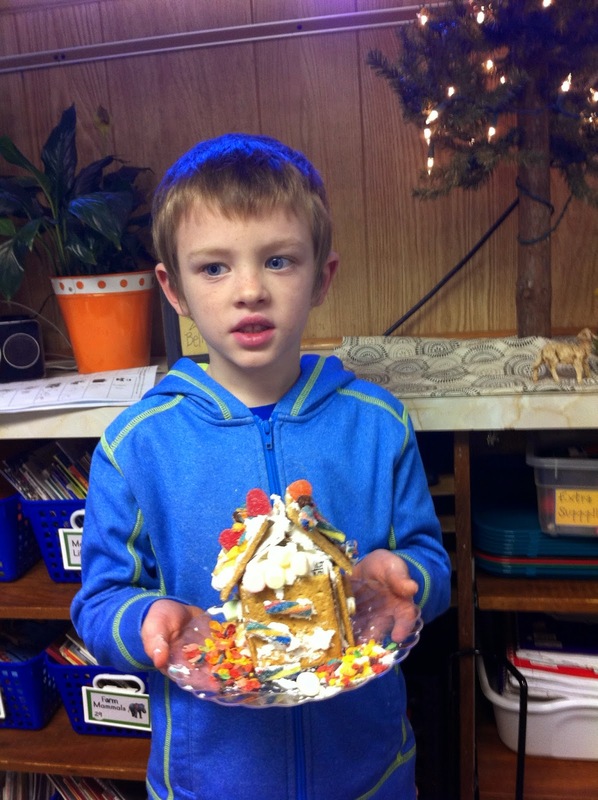 Next week we will continue this theme by acting out the story, making gingerbread houses, and baking some gingerbread cookies. I can name the characters, settings, and major events in a story. I can compare and contrast adventures and experiences of characters in familiar stories. We made these in art with Mrs. Jochem on Wednesday. This picture is cute enough to use as a Christmas card! The Democrat Message has requested we write letters to Santa also and so look for those in the Christmas issue. 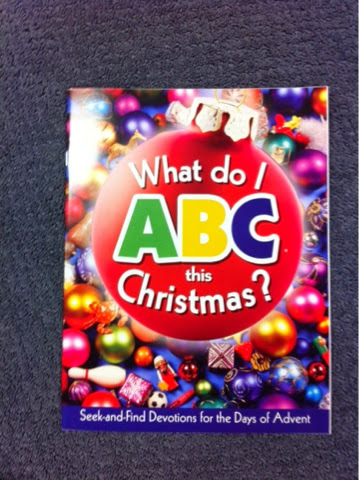 Students will be bringing home the book What Do I ABC this Christmas? Seek-and-Find Devotions for the Days of Advent. I hope that you will find time to share these daily devotional activities and scripture readings with your family. You may even want to stash it away to share again next year during Advent. 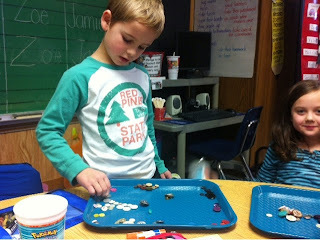 I can sort objects and count the objects in each group. Some other students sorted their buttons by texture, number of holes, and backs. Mrs. Williamson is recuperating comfortably at home after her surgery last Wednesday. Fortunately, the surgery was able to be done in a minimumly invasive way. 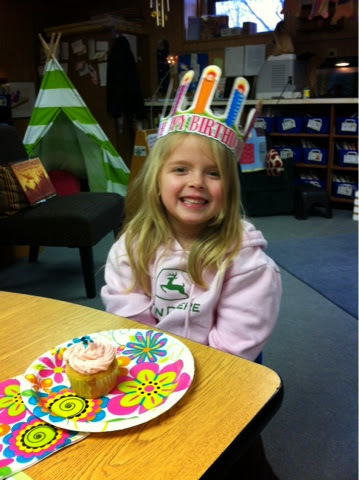 First grade is asking for a small donation from each family to purchase flowers to cheer her recovery. We will be making a card in class and pray for speedy healing for her daily. *Note to self - Do not post to blog before 6:00 AM. Please excuse the spelling errors to those of you who read this BEFORE I made the corrections! May 26 - Jackson's Birthday! 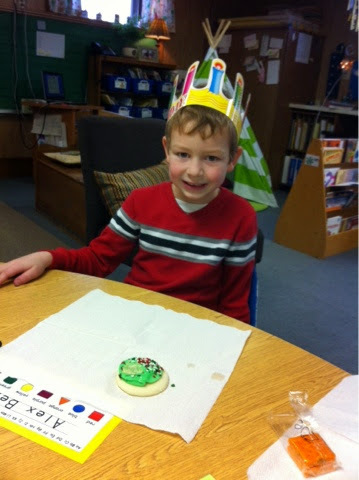 This is my 20th year teaching kindergarten. I feel very fortunate to be one of the people who LOVE their job.